KPD series rail transfer cart is an efficient material transporting cart powered by the rails, and the rails need to be insulated. 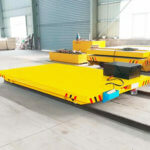 We manufacture transfer carts with capacities ranging from 2 tons to over 150 tons, commonly used in machine shops, warehouses, metallurgical plants to move heavy loads throughout the facility or between crane bays. There are two main types of low-voltage rail powered transfer car for you to choose from, including single-phase and three-phase power delivery. 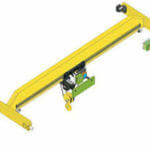 This transfer cart is designed for light duty applications. It is more often used to transport loads less than 50 tons. This transport cart features stable staring, smooth operation, simple structure and long service life. The three-phase low-voltage power delivery usually comes with heavy duty electric rail transfer cart. It provides large load capacity (>50t), high frequency of use, long distance transportation. When the running distance is more than 70 meters, more transformers are needed to compensate for the rail pressure drop. The rails must be insulated. When the travelling distance is over 70m, another transformer should be added. When the rated load exceeds 100 tons, the transfer trolley is generally designed with three-phase low voltage unit and YZ motor. 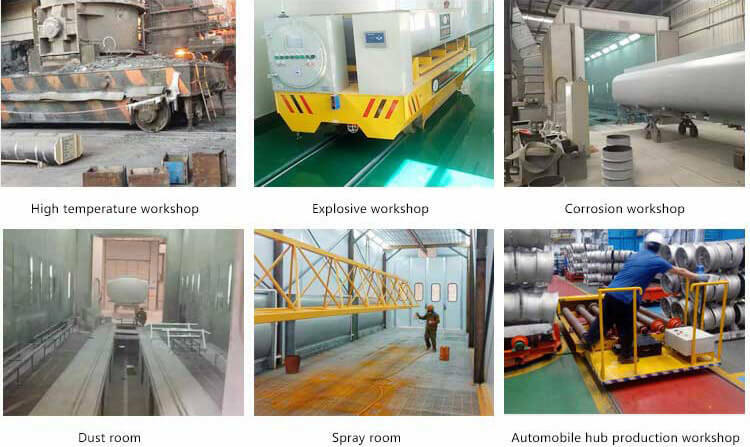 What Are The Uses of Transfer Car? 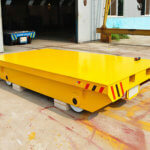 The rail transfer carts are designed to handle and transport large payloads efficiently and safely. 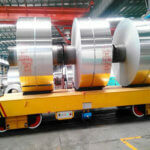 They can handle a variety of materials such as coils, industrial pipes, dies, heavy equipment and structural steel, commonly found in fabrication shops, chemical plants, warehouses, metallurgical plants, etc. The transfer carts can help you improve workflow and productivity, reduce potential damage during load transport and improve visibility of the load. It can be designed with no limiting travelling distance, ideal for heavy duty work cycle. Two carts can be connected to each other for heavier loads, higher efficiency or longer goods. You can equip your rail trolley transfer cart with these options and accessories to work perfectly toward your goals. Deck – you can choose from stand-off, tilting, flat deck, V-deck or custom shaped deck based on your load requirements. Insulation wheel – the wheel is made of ZG55 material. Conductive device is added to get power from the track. Electrical control box – the unit is equipped with power distribution protection, short-circuit protection, over-current protection, emergency power failure protection and safety symbols to ensure a safe and reliable operation. Motor, three-in-one reducer, brake. The motor can be DC or AC motor. AC motor is suitable for flat carts that require frequent starts. The reducer provides stable movement, low noise, easy installation and maintenance. Your required cart specifications, such as load capacity, table size, wheel base, rail inner gauge, running speed and running distance. What control mode do you desire? A fixed pendant or remote control? 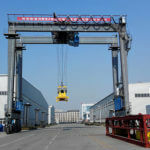 We are trusted material handling equipment manufacturer and supplier in China. Our product range includes overhead crane, gantry crane, jib crane, electric hoist, construction winch, marine winch and transfer cart. You can rely on Aimix group material handling carts for efficient, safe, flexible and adaptable load transportation. All our products are ruggedly made for high reliability and years of trouble-free operation. The major components are sourced from reliable suppliers. You can choose from an imported or made-in-China electrical equipment for your cart. Once you’ve gone through these information, you can discuss with one of our experts online. Our professional engineer and sales team will get together to develop the most appropriate and affordable solution. We also provide a perfect after-sales service for our clients. With years of hard work, we have established a complete service system that comprises 8 service networks (LBS Center in Russia, Uzbekistan, Pakistan, Philippines, Sri Lanka, Indonesia, Algeria and Kazakhstan)and over 60 after-sales service engineers. If you have any questions, please get in touch with our service center at any time. To receive a free quote on rail transfer cart, contact us now!